Epidermodysplasia verruciformis (EV) is a rare, generalized, persistent inherited disorder that predisposes the patients to widespread human papillomavirus (HPV) infection and cutaneous malignancies. It is associated with >30 HPVs, more commonly with Type 3, 5, 8–10, 12, 15, 17, and 19–25. Most of the cases are autosomal recessive with a high incidence of consanguinity in the affected families. This case is being reported due to its atypical presentation, with the absence of the characteristic pityriasis versicolor-like macules, widespread confluent plaques over the extremities and fleshy growths over the elbows and knees mimicking malignancy and with no positive family history of similar lesions or consanguinity. 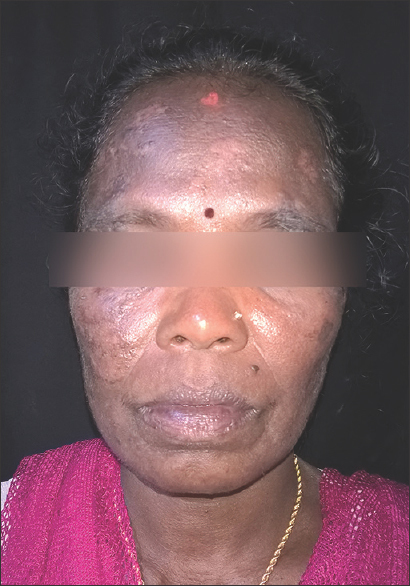 A 42-year-old female patient presented with a history of blackish asymptomatic discrete raised lesions all over the body and face since childhood, which progressed both in size and number over the years and are now persistent. She works as an agricultural laborer and complains of photo aggravation of the lesions. Since the past 2 years, she complains of developing multiple asymptomatic warty growths over the preexisting lesions of the elbows and knees. 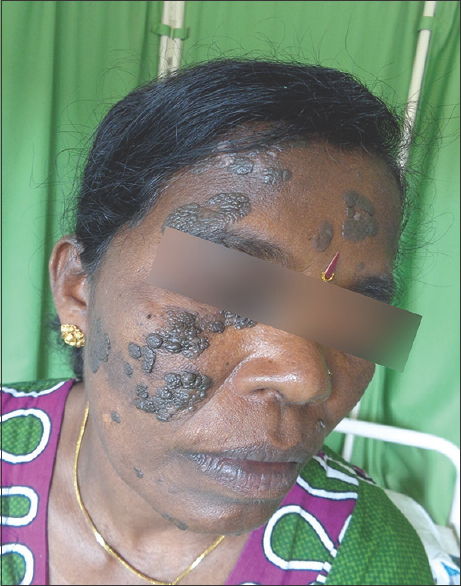 She had undergone electrocautery for her facial lesions, but the lesions had recurred. There is no contributory familial history. On clinical examination [Figure 1], [Figure 2], [Figure 3], [Figure 4] verrucous plaques of varied morphology were seen all over the body, resembling seborrheic keratosis over the bilateral arms and face. These lesions amalgamated to form diffuse thickened plaques over the dorsum of the hands, lower legs, and feet. On the elbows and knees, multiple pinkish fleshy growths with finger-like projections, suggestive of squamous cell carcinoma (SCC) were present. No scaly macules were present on the trunk. The palms and soles were normal. The oral, genital, and conjunctival mucosae were also normal. Hair, nails, and scalp showed no involvement. Systemic involvement revealed no other abnormality. She tested negative for human immunodeficiency virus (HIV), Hepatitis B Virus surface antigen, and venereal disease research laboratory. HPV typing could not be carried out. A clinical diagnosis of EV with query SCC was made. Skin biopsy was done of lesions from the following three sites. 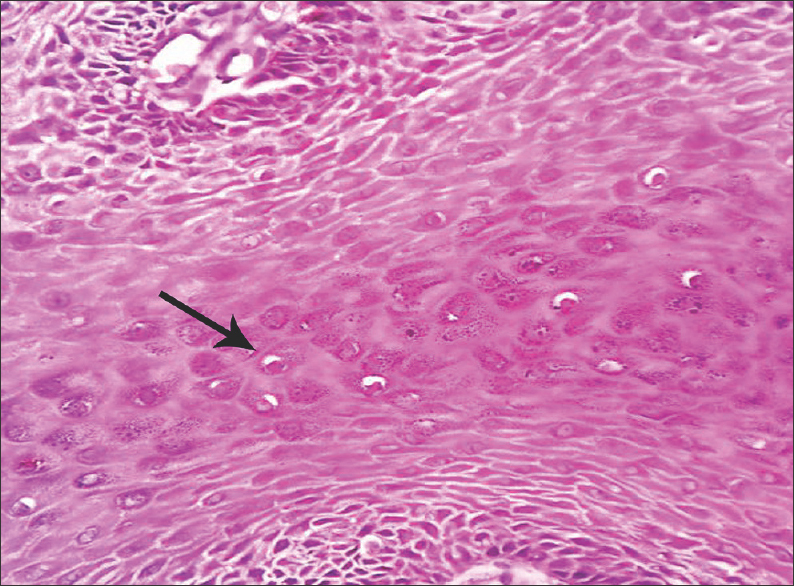 Skin biopsy measuring 0.7 cm × 0.3 cm × 0.1 cm from the fleshy growth over the left knee showed a severely hyperkeratotic and acanthotic epidermis with focal parakeratosis. Dermis was edematous with congested blood vessels. There was no evidence of SCC. Based on the history, clinical features and investigative findings, a diagnosis of EV was established. EV is an inherited disorder in which there is a widespread and persistent infection with HPV, giving rise to a characteristic combination of plane warts, pityriasis versicolor-like lesions, and reddish plaques. Lewandowski and Lutz first described EV as an epidermal nevus in 1922. It is an autosomal recessive disorder in most cases wherein there are mutations in the EVER1/TMC6 or EVER2/TMC8 genes located on chromosome 17q25. X-linked recessive and autosomal dominant forms also exist. Mutations in these proteins are thought to lead to the increased susceptibility to HPV infection and the increased propensity for malignant change observed in these patients. Patients suffering from immunodeficiency, such as HIV, also show an acquired predisposition to develop EV. There are few cases of acquired EV in the setting of organ transplantation. The disease has no preference for gender or race and can be sporadic or familial. A high frequency of parental consanguinity is usual in most reported cases, and >30% of the siblings acquire the disease at some or the other stage. Most frequently HPV Types 5 and 8 are incriminated in, but numerous others have been described including 3, 9, 10, 12, 14, 15, 17, 19–25, 28, 29, 36–38, 46, 47, 49–51, and 59. Clinically, it is characterized by a lifelong eruption of pityriasis versicolor-like macules and flat, wart-like papules, which are associated with a high risk of nonmelanotic skin cancer on sun-exposed areas. The initial lesions often occur in childhood as was seen in our case. 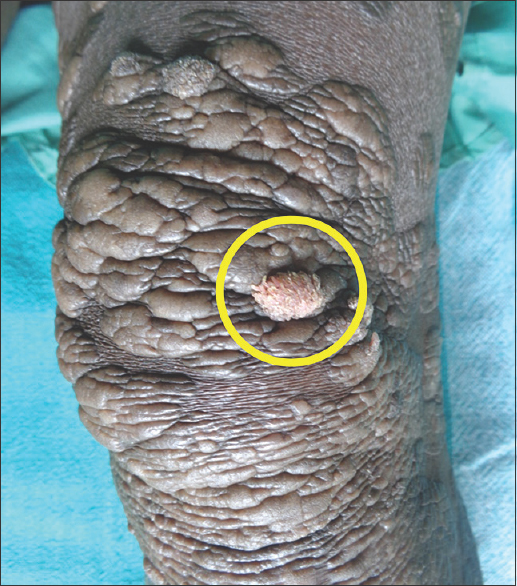 Other benign cutaneous lesions are macules and seborrheic keratosis-like plaques. In 1939, Sullivan and Ellis described a close relationship between EDV and high risk of skin cancer. Dysplastic and malignant changes may occur in the form of actinic keratosis, Bowen's disease, SCC, basal cell carcinoma, or rarely sweat apparatus carcinoma. Lesions over the sun-exposed areas characteristically present with malignant transformation in 35%–50% of patients, especially those 40–50 years of age. However, metastasis is rarely encountered. 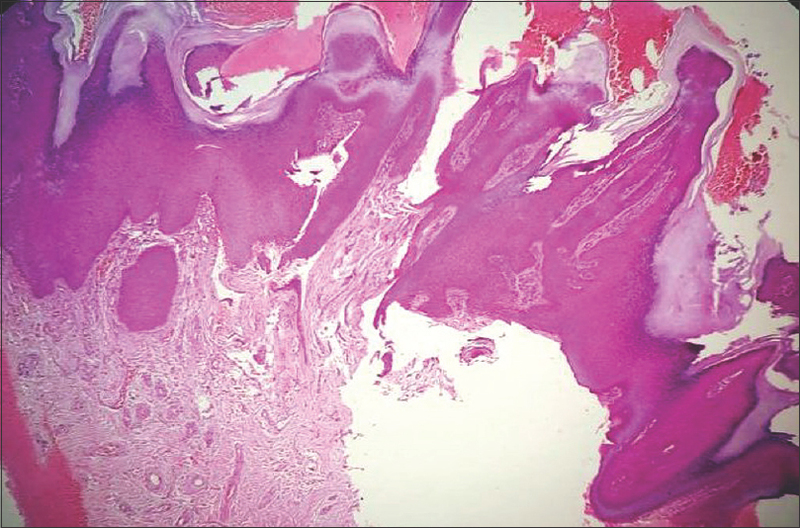 The classic histologic presentation of EV is a verruca plana-type lesion with minimal hyperkeratosis and acanthotic areas where the cells contain perinuclear halos and blue-gray pallor. Treatment of EV remains challenging. Patients should be routinely monitored for the development of cutaneous cancers because of its malignant potential. Surgery being the primary option for localized malignancies. Sun avoidance and photoprotection are strongly recommended. Systemic retinoids, interferons, cimetidine, topical 5-aminolevulinic acid photodynamic therapy have all been used with variable success. Imiquimod has been used to effectively treat SCC in patients with EV. 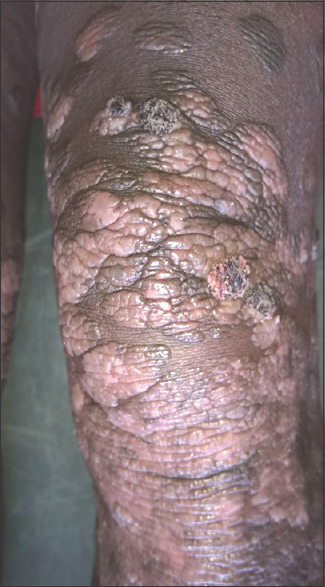 Our patient was a sporadic case with no family history and presented with a varied morphology of plaques which over a period of time became confluent over the extremities and with the absence of the typical pityriasis versicolor-like lesions and no evidence of SCC changes in the fleshy growths over the knees and elbows. Single session of fractional CO2 laser ablation was done for the facial lesions, ten sessions of cryotherapy were performed at weekly interval for the fleshy growths over knees and elbows; and in addition, she received oral acitretin 25 mg/day for 6 months which showed a significant improvement and flattening of the lesions overall [Figure 7], [Figure 8], [Figure 9]. Seetharam KA. Viral infections. In: Sacchidanand S, editor. IADVL Text Book of Dermatology. 4th ed. Mumbai: Bhalani Publishing House; 2015. p. 606-7. Sterling JC. Viral infections. In: Griffiths CE, Barker J, Bleiker T, Chalmers R, Creamer D, editors. Rooks Text Book of Dermatology. 9th ed. Oxford: Wiley-Blackwell; 2016. Lewandowsky F, Lutz W. Ein Fall einer bisher nicht beschriebenen Hauterkrankungn (Epidermodysplasia verruciformis). Arch Dermatol Syphilol 1922;12:306-16. Kalińska-Bienias A, Kowalewski C, Majewski S. The EVER genes – The genetic etiology of carcinogenesis in epidermodysplasia verruciformis and a possible role in non-epidermodysplasia verruciformis patients. Postepy Dermatol Alergol 2016;33:75-80. Zahir A, Craig L, Rady P, Tyring S, Ehrlich A. Epidermodysplasia verruciformis associated with HPV 10. Dermatol Online J 2013;19:2. Boza JC, Peruzzo J, de Oliveira FB, Nazar FL, Bakos RM. 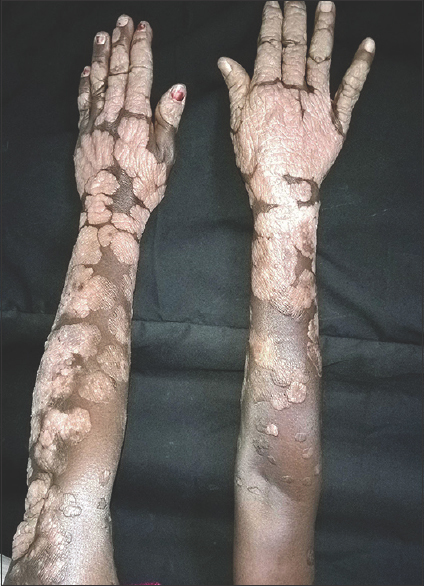 Epidermodysplasia verruciformis-like skin eruption in an HIV-positive patient. Trop Med Health 2014;42:185-6. Hirschman D, Tacastacas J, Rady PL, Tyring SK, Cooper K, Honda K, et al. Acquired epidermodysplasia verruciformis associated with human papilloma virus type 14 in a small bowel transplanted child – A case report. Pediatr Dermatol 2016;33:e1-5. Sá NB, Guerini MB, Barbato MT, Di Giunta G, Nunes DH. 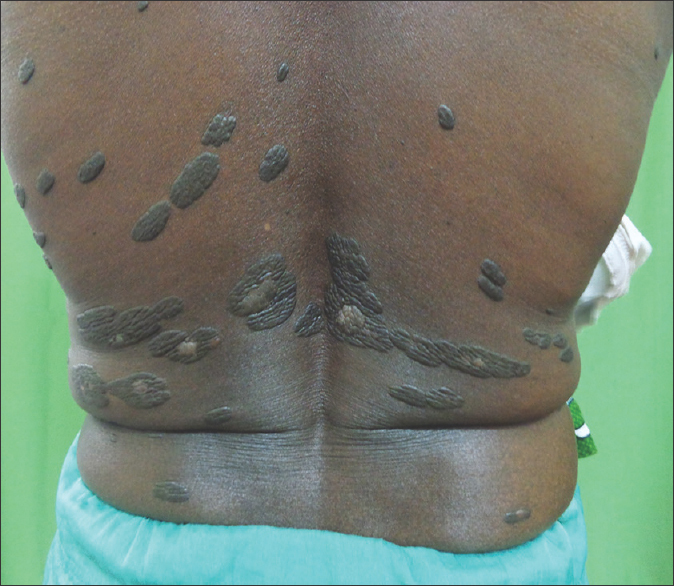 Epidermodysplasia verruciformis: Clinical presentation with varied forms of lesions. An Bras Dermatol 2011;86:S57-60. Sehgal VN, Luthra A, Bajaj P. Epidermodysplasia verruciformis: 14 members of a pedigree with an intriguing squamous cell carcinoma transformation. Int J Dermatol 2002;41:500-3. Emsen IM, Kabalar ME. Epidermodysplasia verruciformis: An early and unusual presentation. Can J Plas Surg 2010;18:21-4. Sullivan M, Ellis FA. Epidermodysplasia verruciformis (Lewandowsky and Lutz). Arch Derm Syph 1939;40:422-32. Agrawal PG, Mahajan SA, Khopkar US, Kharkar VD. Epidermodysplasia verruciformis: An unusual malignant transformation. 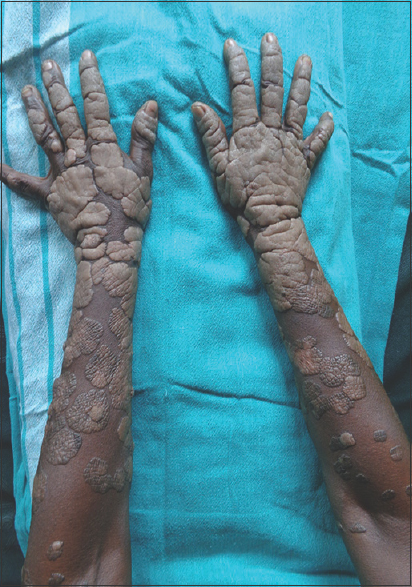 Indian J Dermatol Venereol Leprol 2013;79:97-9. Nuovo GJ, Ishaq M. The histologic spectrum of epidermodysplasia verruciformis. Am J Surg Pathol 2000;24:1400-6.